Regina, Sask. – For the first time in 40 years, the Seattle Thunderbirds are Western Hockey League champions. 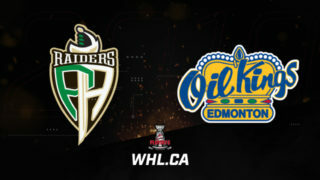 History was made Sunday evening at the Brandt Centre in Regina as forward Alexander True lifted the Seattle Thunderbirds to an overtime win in Game 6 of the 2017 WHL Championship Series. The Danish forward scored 12:36 into the first overtime period, completing an electrifying comeback by the visitors. Co-captain Mathew Barzal was named WHL Playoffs MVP after registering 25 points (7G-18A) in 16 games. Sunday night, there was no sequence bigger than True’s. Taking a pass from Keegan Kolesar at centre ice, True ripped down the right wing before unleashing a shot from the faceoff circle. Pats goaltender Tyler Brown came up with the first save, but the rebound fell to the top of the crease, where the 6-foot-5, 199-pound product of Copenhagen went, burying his 12th goal of the playoffs to give the Thunderbirds a 4-2 series triumph and delivering the first Ed Chynoweth Cup in Seattle’s franchise history. Rookie goaltender Carl Stankowski, he of 17 years, made 28 saves for his 16th win of the post-season. 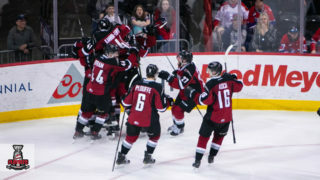 While True’s strike set up a yard sale of hockey equipment on the ice at the Brandt Centre, that opportunity would’ve never come if not for a dramatic comeback by the Thunderbirds. Trailing 3-1 with time winding down in the third period, Game 7 almost seemed inevitable. Overage forward Ryan Gropp notched his seventh of the post-season with 5:22 to go in regulation, getting the Thunderbirds back within one. 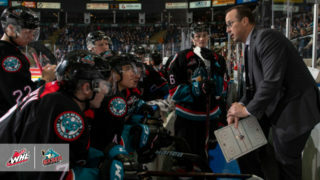 A nervous fog settled in over the sold-out crowd of 6,484 at the Brandt Centre. With a late power play marked up on the board, Kolesar chalked up his 12th goal of the playoffs, blasting a one-timer past Brown to knot the festivities 3-3 with only 2:54 to go in regulation. “I can’t even put it into words right now,” said Kolesar, a 20-year-old product of Brandon, Man. “I was crying earlier. A lot of us were. It’s just such a great feeling to bring this to the organization and to have all the support we have here tonight. It’s just unbelievable. “There is so much character on this team, it’s unbelievable. We’ve had so much adversity with guys being injured, being down on the scoreboard, and we found a way to bounce back. You saw that here tonight – we’re down 3-1 and we don’t give up. Suddenly, Game 7 was an afterthought as overtime loomed large and more than 60 minutes were required. Game 6 proceeded much like Games 1 and 2 did before it in Regina. The two teams battled tooth and nail, without as much as an inch given freely. The opening period of play began with noticeably nervous energy from the sellout crowd. True was flagged for the game’s first penalty as he was sent off for tripping with 13:36 to go in the first period. On the ensuing power play, Sam Steel made the Thunderbirds pay. Taking a pass from Josh Mahura in the slot, the product of Sherwood Park, Alta., let go of a one-timer that beat Stankowski for a 1-0 Pats lead with 12:42 to go in the first period. The Thunderbirds went to the power play for the first time after Dawson Leedahl was sent off for cross-checking with 2:16 to go in the first period, but the Pats killed off the man advantage and the score remained 1-0 after 20 minutes of play. Seattle evened the scoring with 11:05 to go in the second period. Skating in two-on-one, Sami Moilanen used Scott Eansor as a decoy before snapping a shot from the right circle that beat Brown low stick side. 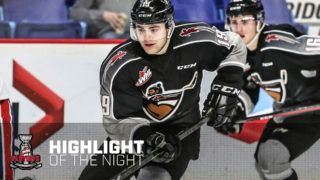 On the following shift, Turner Ottenbreit – not exactly a fan favourite in Regina – caught Austin Wagner with a heavy hit at the Seattle blueline. After a discussion between the officiating crew, the product of Yorkton, Sask., was handed a five-minute major for charging and a game misconduct to go with it. Ottenbreit, of course, knocked down Pats captain Adam Brooks back in Game 1, with a hit just inside the Seattle blueline. The Pats were unable to accomplish anything with the man advantage before Leedahl took a slashing minor, negating the power play with 1:48 left in it. One of the best opportunities of the second period came with little more than six minutes to go. Weaving his way into the offensive zone, Pats captain Adam Brooks dropped for Steel, who paused to elude a defender before sending a quick wrist shot in on net. But as has been the case for so much of the series, Stankowski was on the case, flashing the leather to shut down the Pats star. With that, the score remained 1-1 heading into the second intermission. Regina managed to take the lead midway through the third period. After a botched power play, Mahura drove the net, picking up a rebound off a shot from Jeff de Wit, swatting it home to give the Pats a 2-1 lead with 8:10 to go in regulation. Wagner, who returned to play for the third period, used his speed to add an insurance marker for the Pats. With 6:48 remaining, the Los Angeles Kings prospect burned in on a breakaway, beating Stankowski to make it 3-1. It looked as though the Pats were about to force a seventh and deciding game. But the Thunderbirds had different thoughts. Gropp, Kolesar and True took care of the rest. 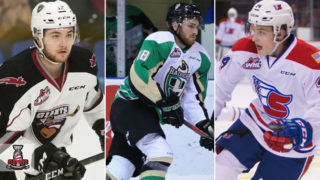 “From the coaches to the GM, to the first- and fourth-line guys, it’s been an excellent ride,” said Eansor, the Thunderbirds co-captain and a 21-year-old veteran of four WHL seasons. “Being here four years, it’s been pretty spectacular. Barzal, who was the 16th-overall selection at the 2015 NHL Draft, was named WHL Playoffs MVP, capping an outstanding 2016-17 campaign in which he was also voted the WHL’s Western Conference Player of the Year, finishing as runner-up to Steel for the Four Broncos Memorial Trophy as WHL Player of the Year. All of this, of course, after he was sent back to Seattle when many expected he was ready to make the full-time jump with the Islanders. For the Seattle Thunderbirds franchise, Sunday’s victory was a long time coming. Founded in 1977 as the Seattle Breakers, the Emerald City’s WHL franchise had to wait until 1997 – with Patrick Marleau leading the Thunderbirds – for its first appearance in the WHL Championship Series. The club came up empty that season, and it was 19 long years before they earned another opportunity. In 2016, the Thunderbirds made only their second appearance in the contest for the WHL’s Ed Chynoweth Cup, falling to the Brandon Wheat Kings in a tightly-contested five-game series that saw the first three games require overtime. Finally, after battling for a second consecutive spot in the WHL Championship Series, the Thunderbirds emerged to hoist the Ed Chynoweth Cup as Western Hockey League Champions in 2017. For the Pats, Sunday’s loss brings an end to an illustrious campaign, one in which Regina’s junior hockey regiment rattled off a record-setting regular season, claiming the Scotty Munro Memorial Trophy as WHL Regular Season champions. “We had a great year and it didn’t work out how we wanted it to,” said John Paddock, head coach and general manager of the Pats. “Losing hurts. It really hurts and they’re really hurting at the time and will be for a little while. “You’re proud, happy with the group or the season on all levels – a lot of good things happened. That makes it a feel-good story until tonight. Now, representing the Western Hockey League, the Seattle Thunderbirds advance to the 2017 Mastercard Memorial Cup, which will be hosted in Windsor, Ont. from May 18 to 28. 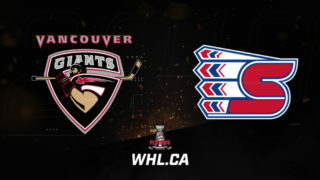 Seattle joins the Saint John Seadogs (QMJHL Champions), Erie Otters (OHL Champions) and Windsor Spitfires (OHL Host) at the 99th edition of the Mastercard Memorial Cup.